This comes as part of the company’s continued commitment to the highest health and safety standards across its sites. After a trial of BOMAG’s new BW 154 pivot-steered tandem roller earlier this year, operators in the business’ Southern division now benefit from the highest operating comfort, thanks to the machine’s well-defined arrangement and its 270° rotating seat, capable of manoeuvring across the full width of the cab. With a split drum and the absence of an enclosed front and rear cab, operators have the ability to always face in the right direction for compaction. This not only facilitates a safer working environment due to the improved visibility and reduction in reversing manoeuvres associated with operating a traditional roller but should also lead result in improved productivity levels as well. 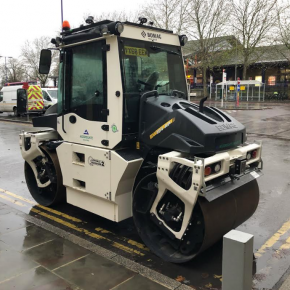 Fitted with BOMAG’s intelligent compaction system ‘Asphalt Manager’, the roller monitors compaction and alerts the roller operator when no further compaction is required. This eliminates over-compaction, optimising the whole-life performance of the asphalt. It also reduces drum bounce and vibration, lessening the risk of our operators developing a repetitive strain injury (RSI). Shaun Hillier, Southern Area Director for Contracting at Aggregate Industries, commented: “We’re always actively seeking improved technologies or new ways of working to ensure that our workforce goes home safely at the end of every day. “Those operators who have trialled the roller so far have found its manoeuvrability to be second to none and it has exceeded their comfort expectations due to the vastly reduced levels of vibration within the cab. With the trial of the BOMAG 154 completed in June this year, Aggregate is rolling out a complete fleet of eight rollers across its Southern division by the end of the year. 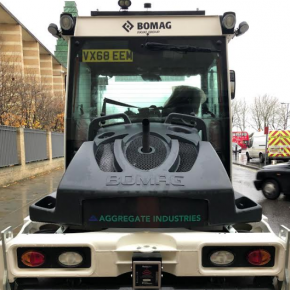 It is also working with Bomag to further improve the health and safety credentials of the BOMAG 154, and as such is currently piloting SmartBrake – a collaborative development of Vision Techniques’ Auto-braking Radar System that’s linked to forward and rear facing cameras – on the roller. Auto-braking technology has previously been used in the waste management industry. It is able to detect an object or person within a defined exclusion zone, giving audible and visual warnings to the driver as they approach them. If the driver ignores these warnings, the radar intervenes and applies the vehicle’s brakes automatically. Shaun Hillier continues: “Even though the standard safety features on the BOMAG 154 are excellent, that doesn’t mean we are resting on our laurels.